The island of Grenada is a Caribbean paradise, full of rich spices and plant life as well as history. From waterfalls and bountiful beaches, to underwater art Grenada is a destination perfect for a getaway from the hustle and bustle of everyday life. Thanks to ShoreTrips, the supplier sponsor of this article, you won’t have a problem finding something exciting to do in Grenada. Grenada, sometimes known as the “island of spice” due to its production of nutmeg and mace crops is an island found in the southeastern Caribbean sea. Together with six other islands the area makes up the island country of Grenada. With ecotourism being very popular in the area, there are many activities and sights to see while vacationing in Grenada. St. George’s is the capital of Grenada, and one its most popular areas. Grenada National Museum is a great way to learn about the area and spend an afternoon. The building the museum is housed in was an array of different things over the years, most notably the French Barracks in 1704. The museum represents the native cultures of Grenada, and within its walls you can find ancient artifacts, sugar processing equipment, and even the first telegraph line installed in the city. 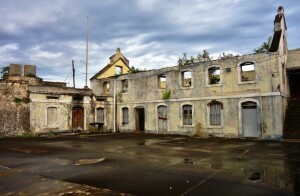 Another site full of history is Fort George. Though most of the buildings are disheveled and dilapidated, walking through the grounds of the French Fort built in 1705 offer a beautiful view of the area below. Many of the buildings are actually used by the police. For an active afternoon outside in St. George’s, make the trek through St. Margaret’s Falls. The waterfalls come from part of a series known as the Seven Sisters, and are located in the heart center of Grand Etang Rainforest. Taking approximately three hours even for the experienced hiker, the trails are full of lush plant life and breathtaking scenery. Being able to immerse yourself into the rain forest in such a way is an experience not to miss when visiting Grenada. Fort Frederick, the island’s best preserved fort, is another site to explore and get a taste of the French history within Grenada. If you are lucky the tunnels might be open, where you can explore as long as you bring a torch or flashlight as they are not lit. Fort Frederick also offers some absolutely incredible views from atop Richmond Hill, where it is located. Walk through its Grand Arches and imagine being transported back to 1779, when the fort was built. For some fun in the sun (and the water) don’t pass up on the chance to see the Molinere Underwater Sculpture Park, which also happens to be the first underwater sculpture park. 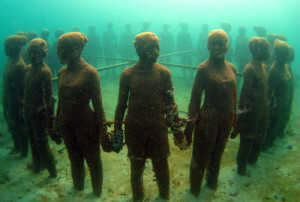 Opened in 2006, it contains a collection of ecological sculpture art and was created by the British sculptor Jason deCaires Taylor. The idea was to help engage the public in the underwater environment around them with the sculptures; these sculptures are actually based on casts from the local people in the community. Molinere Underwater Sculpture park also acts as an aid to relieve pressure on the natural reefs that have increased in popularity among visitors and locals alike. You can scuba or snorkel through the sculpture park, accessed from St. George’s main port or Grand Anse Bay. One really unique way to marvel at the sculpture park is on a glass bottomed boat. With sculpture placement ranging in depth, you have options as to how far down you choose to explore! As previously mentioned, Grenada is known for its spice and herb production. At Laura’s Spice & Herb Garden you have the chance to explore all the different spices, and how and where they grow. From cinnamon and nutmeg to ginger and lemongrass, you can see it all at Laura’s Spice & Herb Garden. The Gardens also have fruit trees, such as orange, mango, and banana. Laura’s Herb & Spice Garden even has an area devoted to plants used for botanical cures, as Grenada is known for traditional herbal medicine. Explore the different plant life, and learn the many different uses for them at Laura’s. After your tour, browse the shop or get out of the sun in a beautiful gazebo located on the property. For an even more in-depth experience of the agriculture in Grenada, head over to The Belmont Estate. Located in St. Patrick, an hour outside of St. George’s, The Belmont Estate is one of the most popular attractions that Grenada has to offer. An authentic 17th century plantation, it gives visitors the opportunity to fully experience a completely operational plantation and learn about Grenada in the process. With tours of the organic gardens and farms, a heritage museum, and even cocoa processing facilities, The Belmont Estate is an experience unrivaled. The estate even has a restaurant, serving traditional Grenadian cuisine. Visitng Annandale Falls, the most easily accessible waterfalls in Grenada, are another great way to soak up the rays of the sun and be surrounded by the nature that makes Grenada so unique and beautiful. 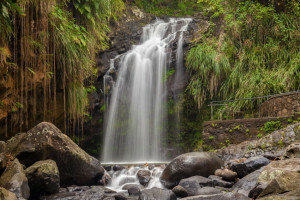 With roughly 32 feet high falls that tumble right into a beautiful blue pool of water, Annandale Falls is not something to miss on your trip to Grenada. There are even paths and trails leading to and through botanical gardens surrounding the falls. 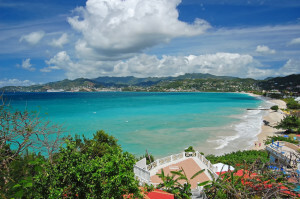 It would not be a vacation in Grenada without a visit to Grand Anse Beach, with its clear blue water and soft sand. Grenada insists that all of its beach remain open to the public, even the spans of beach attached to resort property. You can see vendors selling herbs and spices, fishermen hauling in the catch of the day, and residents and visitors tanning along the two mile stretch of sand. If you get a little too hot in the sunlight, explore the Grand Anse Craft & Spice Market located near the beaches. With a plethora of art, crafts, jewelry, spices, and even leather goods to choose from, the market is an excellent way to get a true feeling of the local vibe. For a Caribbean expedition that gets you involved with the nature surrounding you, Grenada is the place to go and ShoreTrips has you covered. Depart the capital of St. George’s to take a guided garden tour, exploring Grenada’s award-winning private gardens and nurseries. Enjoy a wonderful morning visiting private gardens throughout the St. George’s region. This tour will introduce you to a lush and beautiful countryside which, to us, is reminiscent of that of Europe. Your drive with us will take you through lush mountains to the colourful Grenville Market on the Atlantic coast.